Every night, either my husband or I make dinner for our three kids. We both work hard at our jobs, so it is an effort to put together something nice, but we think it is important. Even so, we can’t get our kids to come to the table. It’s all about the TV or texting friends. Do you have any tips for getting kids to the table without yelling or threatening? Collect your kids. Many of my clients have tried this approach, telling me it works magically. A few minutes before dinner, find your children and spend a minute joining them where they are. “Oh, you’re watching that show with the talking duck? He’s really funny — is that turtle his friend? Want to head down to dinner pretending we’re ducks?” or “It looks like it’s really hard to get past that hairy looking guy (on a video game). Tell me about him on our way to dinner!” By spending a moment connecting with your kids, they will be far more inclined to cooperate with your request to turn things off and join you for dinner. Talk — and listen. Most kids tune us out when we holler and scold. Try sitting down with her husband and each child, one at a time, to share your desire to make sure dinnertime is stress-free. Listen to your children’s point of view without interrupting; perhaps they feel they don’t get enough time online, or they don’t look forward to dinner because one sibling constantly teases them. The more you can get feelings out in the open, the more you’ll reestablish yourselves as a team. Involve them in the meal. Many parents forget that kids can be terrific cooks. 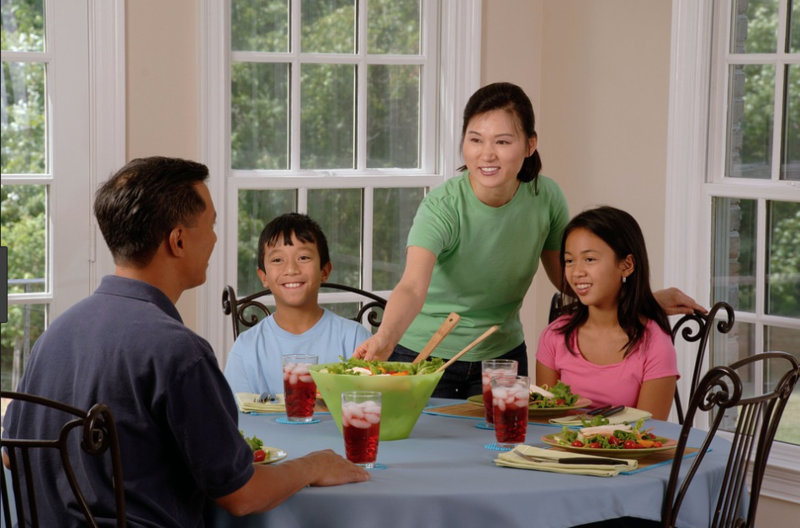 Let your children help with meal preparation, or invite them choose a night where they plan the menu and you or your husband become their able-bodied assistant! This can be a terrific way to get some one on one time with each of your three kids. If cooking isn’t their thing, let them set the table as though you’re eating in a restaurant, or plate the food in their own creative way. Create fun rituals. Believe it or not, most children adore being with their family when it’s fun. Some parents set a happy tone for dinner by singing a song just before they begin eating. Others have each person share something good about their day, or tell a joke. Children find it much easier to disengage from other activities and come to the table when they know they will be nourished emotionally, as well as physically. My friend Laurie David wrote a terrific book called The Family Dinner which has great meal-time activities that make meal time more appealing. Invest in creating an inviting mealtime atmosphere and your kids may end up hanging around the kitchen, waiting for you to ring the dinner bell!